Whether or not Jack Straw and Malcolm Rifkind have been guilty of wrongdoing according to the evidently rather lax standards which British politicians require of themselves is a matter to be decided by the Parliamentary Commissioner for Standards. But the very fact that they so much as met with what they believed were people willing to pay for their services demonstrates an appalling lack of judgement and is symptomatic of the corruption at the heart of the British state. Let us not forget that both these individual lately strode the stage of our independence referendum campaign, draped in all the trappings of status and power with which the British state rewards its loyal servants, loudly denouncing SNP politicians and Yes campaigners of impeccable character in the highest moral tones. They used the standing and influence which the British state has bestowed upon them to cajole the people of Scotland into sacrificing their sovereignty for the benefit of the British establishment. They purported to be doing this in the interests of the people of Scotland. But how are we to believe this when they have been shown to be at least willing to consider prostituting themselves to corporate power for personal gain? Let us not forget either that in the wake of the referendum it was Jack Straw who demanded that the people of Scotland be stripped of their democratic right of self determination. In a fit of hypocrisy that speaks to fairly of what we have come to expect from the British establishment, he declared the people of Scotland unfit for such responsibility when he was apparently quite prepared to act in a way that calls into question his own fitness as an elected representative. For the people of Scotland the coming election is, above all, about trust. It is about whom we can be reasonably sure will most effectively represent Scotland and its people in the British parliament at a time when our interests sorely need to be effectively represented. Surely by now it has been sufficiently demonstrated that those embedded in and wedded to the British political system cannot ever be trusted to speak for the people or for Scotland. The British state needs to be shaken to its very foundations. It needs to be reminded of the democratic power that can be wielded by the people, just as people need to be reminded of the power that they own. The people of Scotland, inspired by the Yes campaign, have experienced their awakening. It is time to send a clarion call that will resound throughout these island and inspire others to challenge the old order and the old ways. We do this quite simply by voting in huge numbers for the one viable alternative to the British parties. Only the SNP is in a position to be the catalyst for meaningful change. A vote for the SNP is a vote for a better politics. From reports of party donations it looks like the British establishment is rallying round its political servants. (SNP donations dwarfed by Labour and Tories as parties build election war chests) Big business and other vested interests are pouring money into the coffers of the British parties as they desperately seek to resist the tide of change flowing from Scotland. A tide that threatens to sweep away the comfortable certainties of the old order and the old ways. But it is not clear how much good this filling of the British parties' "war chests" will do. The establishment parties already have massive resources, not least in terms of the compliant and complicit mainstream media. They have also been shown to be prepared to stoop to any base practice as they fight to preserve the power and privilege of the British state's ruling elites. All of which only just helped them scrape a rather pyrrhic and evidently inconclusive victory in Scotland's independence referendum. What use is their money, their propaganda machinery and their total lack of scruples against the will of the people? So long as there is a functioning democratic process in the British state, however flawed, the ruling elites can be challenged. The people of Scotland have woken up to this fact. The people of England have yet to do so. Last night, Nicola Sturgeon faced a pack of the British establishment's attack dogs on BBC Question Time. Was she fazed? Not in the slightest! Because she knows that however enormous and vicious the snarling beast of the British state may be when cornered, it is no match for the popular power that Scotland's First Minister represented with such commanding calm. On a number of occasions recently I have mentioned the phenomenon of propaganda cues, or prompts. These are "lines" devised by the teams of media advisers - or "spin-doctors" employed by political parties. They are generally recognisable because they are not concerned with policy issues but with a process of manipulating the public's perceptions of political rivals. The "smear story" is the most obvious of these. But propaganda cues can be more subtle. The point is that their main purpose is, not necessarily to do direct and immediate damage, but to let supporters know what to focus on at any given time and to provide material that others can reference repeatedly in an ongoing propaganda campaign. The idea is to generate a meme. Very often, this meme is a complete lie. Or, at least, a severe distortion of the truth. But it is used by those who pick up on the cue as if it represented established fact in the hope that people will thoughtlessly accept it as such. Very often, these cued onslaughts appear when a politician or party is in trouble. They are used to divert attention from a serious gaffe or scandal - such as Jim Murphy's recent attack on NHS Scotland on the basis of totally spurious procedure cancellation statistics. The piece featuring former Scottish Tory leader, Annabel Goldie, in the Daily Record on Tuesday 17 February is an excellent example of a propaganda cue. We can expect that it will be dutifully picked up by commentators in the British media and British nationalism's rag-tag band of amateur propagandists on various social media platforms and in the below-the-line comment facilities of the British press. What generally gives these things away is a lack of substance. Looking at the piece in the Record, for example, we find the relationship between the SNP and the Tories described in a way that makes it appear almost like a formal coalition. The aricle makes the claim that the two parties "worked side by side. There is a reference to a "close relationship" between Goldie and then First Minister, Alex Salmond. Only as we read on do we find Goldie admitting that she only ever spoke directly with Alex Salmond on the single issue of drugs strategy, which was being developed pretty much on a cross-party basis. Such honesty is a relatively new feature of these propaganda prompts. Goldie is smart enough to know that, however much the mainstream media can be relied upon to stick to the propaganda line, the piece will inevitable be torn to shreds in the more critical alternative media. (See Wings Over Scotland - http://wingsoverscotland.com/the-imaginary-alliance/) She needs a get-out clause. She needs to be able to claim that she said something true, even if 99% of the piece is blatantly dishonest. She can afford to give the game away safe in the knowledge that this bit will never be mentioned by any of those who pick up the propaganda cue. As noted above, the estimable Stu Campbell has already dissected the Goldie article. But is worth noting here that on most, if not all, of the occasions when the minority SNP administration was defeated, British Labour MSPs voted with their future Tory allies in Better Together. Meanwhile, just about the only times the Tories voted with the government was on budget votes - when John Swinney had held out on a couple of bones to throw their way so that they could claim to have won "concessions", e.g. the extra 1000 police officers. Then, as now, the only “informal alliance” in evidence was the cabal formed by the British parties at Holyrood. But there is a rather more glaring indication of this habitual close co-operation between (or among, if we take account of the LibDems) the British parties. Where has this British nationalist propaganda cue from one of Scotland's leading Tories been published? It has been plastered all over the Daily Record, a newspaper which is generally regarded as the house organ of British Labour in Scotland. British Labour's rapidly diminishing band of loyalists are being asked to take their lead from a top Tory. Rather than trying to sneakily steal credit for the SNP administration's moves to improve access to relevant statistical information, it would be more appropriate if Murphy's Mob were to take responsibility for their atrocious conduct in rushing to malign health service staff with such unseemly haste that they couldn't even be bothered to read the figures properly. This whole affair has exposed the corrosive cancer at the heart of British Labour in Scotland. A combination of hunger for the status that they themselves squandered and intellect-crippling hatred of the party which has filled the space they themselves chose to vacate drives them to latch on desperately to anything which looks even remotely like a stick with which they can beat the SNP. All too often that stick turns out to be a serpent which turns around and bites them on the proverbial. What hope is there of the kind of "change" which the political automatons and ex-Project Fear spin-quacks of British Labour in Scotland talk about incessantly when they can't even bring themselves to acknowledge the savagely bitter mindset; the arrogant sense of entitlement; and the gaffe-prone pettiness that was so starkly evident in the relish with which Murphy slandered NHS Scotland over the issue of cancelled procedures? Nobody from Murphy's Mob has apologised for a malicious attack on our NHS which was only the latest and the worst (so far) in an ongoing campaign of calumny. Nobody has taken responsibility. Instead, they laughably try to blame the SNP, and/or push blame onto some anonymous staffer. Mealy-mouthed Jenny Marra will concede no more than that "a mistake was made". Damn right a mistake was made! It was Marra and her boss, Murphy, who made it! I have long maintained that all elections - and, arguably, this coming election in particular - are decided, not on the issue of the economy as is invariably maintained, but on the issue of trust. Voters do not vote on the basis of the details of party policy on the economy and other issues. They vote on the basis of who they can most trust with the task of running the economy and the country. Or, who they least distrust. It's all relative. Jim Murphy and the whole of British Labour in Scotland seem intent upon providing almost daily reminders that they simply cannot be trusted. Aidan Kerr has a problem. In an article on the STV news website (Analysis: Why would the SNP want to put the Red Tories in power? ), he refers to something he hears his SNP friends exclaim apparently unaware that his SNP friends haven't exclaimed at all. The voices are entirely in his own head. It is a common enough phenomenon. Media commentators purporting to discuss the SNP when, in fact, what they are talking about is the caricature of the party contrived by the British media. In his opening paragraph he asserts that the SNP repeatedly tells us that they and the Labour Party "don't mix well". The reality, of course, is that what the SNP has actually been saying is that they and British Labour could quite conceivably work together if only the latter would put aside its irrational hatred of the former and remain true to at least some of its principles. Aidan is clearly confused. Because he starts off by denying the whole premise of his article, which is little more than a long-winded whinge about the SNP suggesting the sort of deal with British Labour which he begins by claiming that the SNP has "repeatedly" dismissed as impossible. No. I don't get it either. Then there's the stuff about "Red Tories", which Aidan represents as an "SNP line". But is it? Certainly, the term is used a lot as a form of shorthand for those who are sickened by British Labour's hypocrisy in standing shoulder to shoulder with their Tory allies in the anti-independence campaign. It is similarly used by those referencing British Labour's support for the austerity agenda and other areas of policy where they are separated from their Project Fear partners by no more than the proverbial fag-paper. But does this make it an "SNP line"? If it does, then it is most assuredly not a line which is exclusive to the SNP. You are at least as likely to hear it from the grumbling remnants of support that British Labour in Scotland still clings to. The fact that some people who use the term "Red Tories" also happen to be pro-independence is not sufficient cause to label it as an "SNP line". Again. Aidan is analysing, not the reality of the SNP, but the party as it is portrayed in the British media. No wonder he gets things so tragically wrong. He also misses the fact that epithets such as "Red Tory" are a quick and easy way of saying something more complex and nuanced than what is implied by a superficial; appreciation of the term. When people call British Labour "Red Tories" they may be alluding to the party's alliance with the Conservatives in Better Together and/or in Holyrood. Or they may be thinking of the party's undoubted drift to the right of British politics and the lack of anything to seriously distinguish them from their partners in the "Great British Duopoly". They could also be referring to the fact that British Labour and the Tories are absolutely identical in one regard that looms very large in Scottish politics. Both explicitly put the priorities of the British state before the interests of the people of Scotland. They are the same in that a vote for either leads to very mucg the same outcome. More likely, when people talk of "Red Tories" they have all of these things in mind. Aidan attempts to dismiss the tag simply by tagging it an "SNP line". But he fails utterly to refute any of what the term means. Yet another regard in which Aidan is tragically wrong is his assertion that, to SNP members, "Labour represents everything they are not". The problem is not that Labour represents something which is anathema to the social democratic SNP, but that British Labour has ceased to represent social democratic Labour values. The SNP and what, for want of a better term, we might call "Labour-minded folk" are not the natural enemies that Aidan Kerr supposes. In fact, they are the most unnatural enemies. As the Yes campaign proved, there is a comfortable affinity between Labour-minded folk and the generality of SNP members. The animus is entirely associated with British Labour's party machine - not the people this machine has alienated. Finally, Aidan exhibits a rather naive understanding of the way British politics works. The UK is, nominally at least, a two-party state. In reality, it functions more like a one-party state due to the way both the main British parties are in thrall to the same interests. The British parties and the British establishment as a whole would be delighted if the SNP at Westminster were to be "motivated by principle" to stand aside from the procedures and process of government, contenting themselves with causing a "rammy" while leaving the British parties to pursue their agenda. Aidan makes the mistake of attempting to simplistically translate the faux rivalries of the British political system to Scotland's distinct political culture by positing a similar SNP/Labour dichotomy. But the real divide in Scottish politics is not along such "traditional" lines as right and left. The real divide in Scotland's post-referendum politics is between British and Scottish parties. There is no doubt that the legacy of the Yes campaign has been generally positive. Scotland's politics is, for the most part, in a rather healthy state with very high levels of engagement and a political discourse that is rich and diverse. The fly in the ointment of Scottish politics is the dumb contrariness of those who oppose everything that the Scottish Government does, not on the basis of any rational assessment of policies and actions, but because of a deep, unthinking animosity towards the SNP. The Named Person issue is a case in point. The hysteria with which some have reacted to the proposal is so massively out of all proportion to its effect that one can only conclude that it is driven by something other than genuine concern for families. If a rational person was designing a family support system from scratch, a clearly identified, easily accessible single point of contact would be one of the first things they would think of and an absolute minimum requirement. It may be regrettable that families sometimes require the support of state agencies and deplorable that children betimes require protection from those who should be their protectors. But it is nonetheless the reality with which we are obliged to deal. In all too many cases the basic family unit is inadequate in one way or another and the support network that ideally would be provided by extended family is unavailable. In such circumstances, a duty of care falls on society as a whole, and the only practical means of discharging that collective responsibility is through state agencies. The role of government is to ensure that these agencies operate effectively on our behalf. And that is all the Named Person proposal implies. A simple adjustment to existing arrangements which is so obviously sensible that it is difficult to understand why it wasn't done before. Those who talk of Named Persons subverting the role of parents understand neither the role of the Named Person nor the role of parents. They foolishly imagine the ability to be a good parent to be something which is innate and instinctive when, in fact, it is a learned skill which, in a fragmented and increasingly atomistic society, many do not have the opportunity to acquire. They suppose the parent to rightfully have an absolute authority in relation to the child which can only be questioned if and when the parent has demonstrated that they are unfit to exercise that authority - invariably in ways that are detrimental to the child. Worst of all, they are all too commonly driven by political prejudice to object to anything the SNP administration does regardless of the merits, or even the facts of the measure. There are undoubtedly matters relating to the implementation and operation of the Named Person arrangement which require clarification. That is why we have a consultation process. The responsible thing to do is drop the politically motivated hyperbole and engage constructively with that process. The unseemly hysteria with which the British establishment responds to pretty much anything Nicola Sturgeon says (Critics accuse Sturgeon of trying to 'bankrupt Britain' over £180bn public spending demand) gives us as a powerful reminder of the terror which is gripping the ruling elites of the British state as they face the very real prospect of disruption to the cosy arrangements which serve them so well, and the people of these islands so ill.
Let us be clear, it is not about the economy. The dismal science of economics is not definitive. It is merely a tool by which the powerful manipulate the powerless. For all the portentous talk of "bankruptcy", the real issue here is not money, but power. 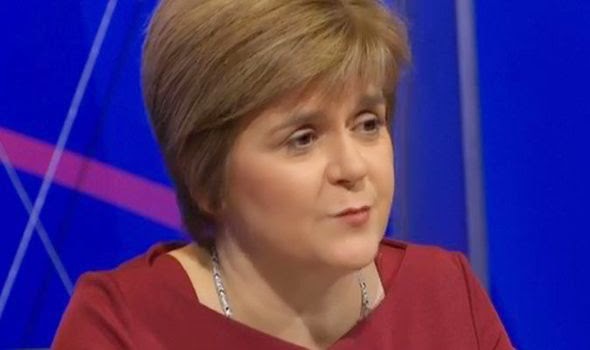 Had Sturgeon suggested spending £180 billion on some shiny new weapons of mass destruction; or to prop up some despotic foreign regime; or on some grandiose infrastructure project entirely for the benefit of London; or to indemnify the obscenely rich against the consequences of their own avaricious folly, then nary an unnaturally perfectly formed eyebrow would have been raised among the clique which considers itself divinely appointed to order our lives. What concerns these ruling elites is not any threat to the economy - which would hardly touch them anyway - but a challenge to their power. Nicola Sturgeon and the Scottish National Party have come to represent a much wider political force which, as it gains momentum, poses the menace of meaningful, progressive change such as is anathema to conventional power. Every small success for the SNP is seen by the British establishment as bringing us closer to that tipping point at which the old structures of power and privilege are swept away by a tide of democratic demand. For decades, the aspirations of progressives and reformers have been safely redirected into the "safe pair of hands" that British Labour has become. Or into fringe parties which are safely ineffectual on account of their eccentricities. But the mass political awakening occasioned by the Yes campaign is different. To the considerable extent that the SNP is the manifestation of this new politics, it represents a force which the British establishment views with increasing trepidation. Not necessarily because the party itself poses a direct threat to the structures of power and privilege which define the British state, but because it offers encouragement to those who had long since retreated into apathy. The British establishment certainly hates the Scottish National Party. But what they truly fear is that, by challenging the Westminster system from within in ways that can only be portrayed as extreme and irresponsible at the cost of looking foolishly hysterical, the SNP may set an example which rouses progressives in England from their torpor. I see Gordon Brown has made another of his interventions (Labour in pledge to go beyond powers of ‘the vow’). It's all lies and deception, of course. There cannot possibly be a "distinct Scottish ­Labour manifesto" for the very simple reason that "Scottish Labour" is not a distinct political party. It is no more than an accounting unit of British Labour. A branch office with absolutely no authority to formulate policy. Murphy's bosses in London have found it expedient to tolerate his posturing as if he was a real party leader because they desperately hope that he can dupe Scottish voters into giving British Labour yet another chance. But the moment those votes are in the bag, Murphy will be slapped down just as his predecessor was. And now Murph The Mendacious is joined by Brown The Blether. A dishonest, incompetent bag of wind and pish whose only attribute is a wholly inexplicable ability to attract the most sickeningly sycophantic attention of the media. Brown is already, by his own boast, an "ex-politician". He has no authority and no influence now. And he will have have even less when he steps down as the absentee MP for Kirkcaldy and Cowdenbeath. Brown is not "credited with playing a key role in the defeat of the Yes campaign". He is blamed for the mass deception of the infamous "Vow". And now he imagines he can pull the same confidence trick with a "Pledge". Stewart Hosie sums it up perfectly. British Labour in Scotland are "pledging" nothing that they haven’t previously said was already being delivered - after first claiming that it was never part of what had been promised. The phrase "all over the place" hardly seems adequate. But there is something interesting about this laughable pretence of offering "more powers" supposedly over and above the "Cameron's Clauses" which are a watered down version of the Smith recommendations which, in turn, merely paid lip service to a vacuous "Vow". The frantic flailing of the British parties as they try to find some baubles shiny enough to beguile a few Scottish voters underlines the fact that devolution is entirely about withholding powers that should rightly belong with Scotland's democratically elected parliament. It also illustrates the point which underpins the gradualist approach to securing independence which is proving so successful. As more powers are devolved, however minimal or even illusory those powers may and however grudgingly they are granted by the Westminster clique, it becomes increasingly difficult for British nationalists to justify the continued withholding of other powers. Imperious Britannia's jealous grip on Scotland is gradually being loosened by increasing numbers of people asking the simple question, "If this, why not that?". If the people of Scotland are deemed fit to exercise powers that British politicians claim are extensive and significant, why then should we continue to tolerate being denied the powers that we want - the powers which every other nation takes for granted? If the British establishment had a persuasive answer to that question, they wouldn't be calling for help from Gordon Brown as they frantically try to preserve the structures of power and privilege which define the British state..